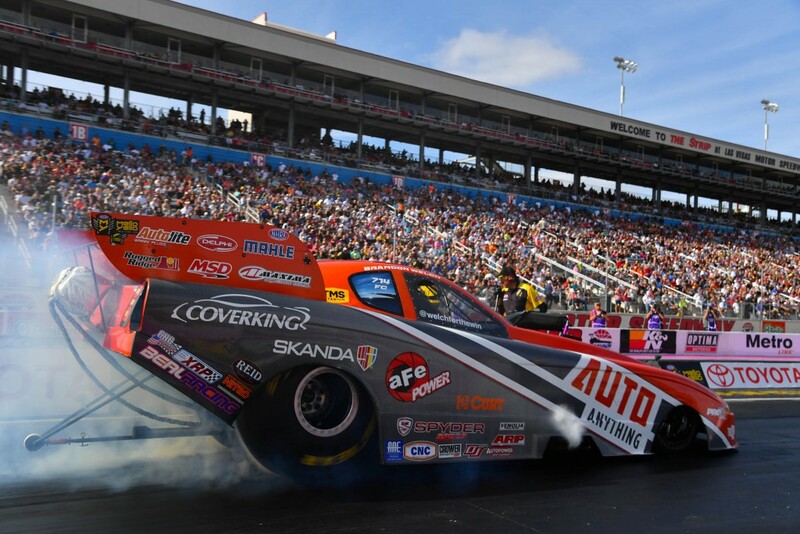 LAS VEGAS, NV – With 24 nitro funny cars competing for 16 qualifying positions, the NHRA Toyota Nationals from Las Vegas Motor Speedway presented the possibility for the quickest funny car field in NHRA history. The Beal Racing team was up for the challenge. Friday’s qualifying sessions started out slow. In the first round, a dropped cylinder at the hit of the throttle drove the car toward the center line and driver Brandon Welch aborted the run after 300 feet. In Friday’s second qualifying round, the car experienced tire shake at 100 feet and Welch attempted to pedal the car, but experienced an engine failure and small fire. Moving into Saturday, the team sought to lay down a baseline pass to the finish line in front of a sellout crowd in the third qualifying session. The car responded, covering 1,000 feet in 4.20 seconds at 292 mph, a career best for Brandon Welch. The Beal Racing crew scrambled to repair engine damage incurred during the run, however they just missed the call for session four, leaving their 4.20 on the board. The event lived up to expectations; the field posted a 4.045 second bump spot. Brandon Welch ended the weekend 19th. The team shifts focus to the Auto Club Finals in Pomona, CA, looking to put an exclamation point on the season November 10-13, 2016. San Diego-based Beal Racing campaigns a 300+ mph nitro funny car on the NHRA Mello Yello Drag RacingSeries. The team is owned by Chuck Beal and driven by 2016 rookie of the year contender and Chuck’s grandson, Brandon Welch. After 45 years in drag racing, veteran driver Beal handed over the reins of the family race car to grandson, Brandon in 2015. Beal Racing proudly showcases sponsorship from AutoAnything, aFe POWER, Coverking, Spyder Auto, Maxima Racing Oils, MSD, Autolite, and MAHLE Clevite. To learn more about Beal Racing visit www.bealracing.com or tune in to NHRA competition on Fox and Fox Sports 1.